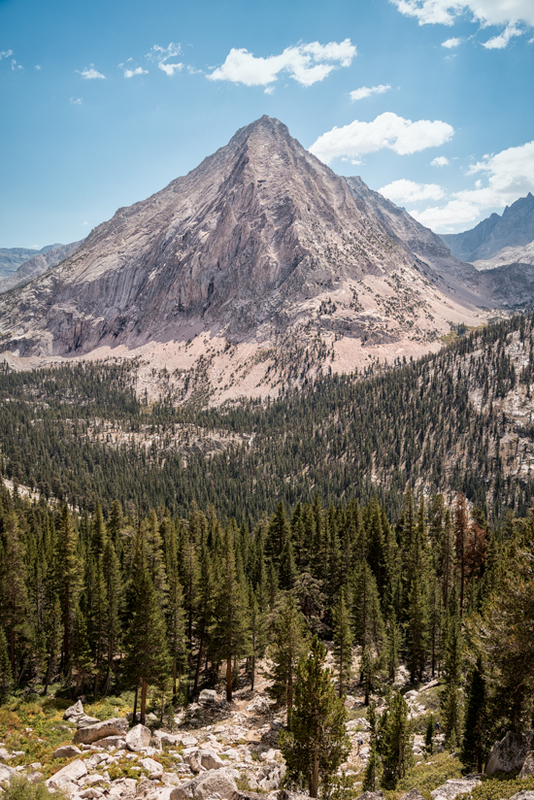 The Most Beautiful Mountain on the John Muir Trail? Browse: Home » The Most Beautiful Mountain on the John Muir Trail? I completely agree. If you haven’t checked out East Vidette in the spring when it still has snow, I highly recommend it – especially viewed from Bullfrog Lake. Thanks, Bill. In two years I’ll be living near the Sierra Nevada and all these places people talk about will be on my list, including Bullfrog Lake in the spring. I like your choice. Just finished our JMT, guided, in part, by your book. Thanks. Speaking of videttes, my brother-in-law and I were looking forward to camping at Upper Vidette Meadow, which everyone who’d heard of it told us “was beautiful.” Not sure we every found it. We did camp at a bear-boxed camp area perched above a creek, near as we could tell UVM, but never saw anything that looked meadow-esque. Can anyone help? Thanks, Bob. Appreciate the kind words about the book. As far as “Upper Vidette Meadow” is concerned, sometimes different places in the Sierra Nevada go by the same name. The Upper Vidette Meadow that I know is quite a ways off the JMT, but there is no doubt a meadow, near Vidette, which is “up” from somewhere, that could honestly be called “Upper Vidette Meadow”. If there is a place I definitely want to check out I always make sure it is entered into my GPS before the hike, or at least marked on the map. Sounds like you found a great place, regardless. Bob, you actually walked through “upper vidette” when you climbed up and out of “Vidette” to the best of my knowledge . . . but it’s all a bear haven anyway, so staying down in Vidette or probably even “upper” you might have saved yourself the hassle. They used to have a few bear boxes, one in Vidette and another in upper, but got rid of those within the last few years, than (I think???) replaced just the one there at VM. The next one is of course at the spot you mention camping at. Thanks, Bob! Appreciate the input. My favorites in order from this year’s JMT hike are: Cathedral Peak, Banner/Ritter, Spencer (from southern end of Evolution Lake), and North Palisade from Mather Pass. All great choices. Thanks for the comment!